Built of Dade County pine in 1905, this historic pioneer home still sits on the edge of an avocado grove planted at the turn of the last century. 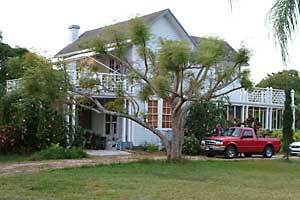 The home has had additions over the years, but the original wooden structure still remains intact. 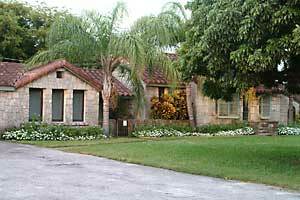 George Kosel migrated to South Florida from New York around the time Redland was formed in 1898, establishing one of the first homesteads in the newly emerging settlement. His 160 acre Jungle Grove, established in 1902, produced strawberries, oranges, mangos, grapefruit and a large variety of avocados. George married Maria Gazzam, another pioneer homesteader and had two children, George Kosel, Jr and Bodil Kosel Lowe. Bodil still lives on the homestead and maintains the avocado groves. Please respect privacy by merely observing the property from the road. A historic marker near the road tells a brief history of the homestead. 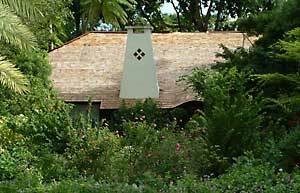 Unlike any other home of the Redland pioneer era, the Walton house, built with wooden frame and stucco in 1919, features a large gable roof that imitates the signature thatched roof of similar English structures. W.K. Walton started with four acres of avocados here, beginning the first commercial nursery of its kind in South Florida. The home and rare plant garden were restored in 1985. The home and garden are easily visible from the side of the road, but please don't go in the driveway or disturb the residents. Marvelous example of oolite rock construction, this home dates back to the early 30s when land was purchased by William H. Cooper. 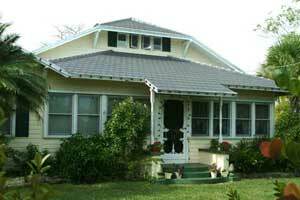 Built in 1912 by John Lindgren, who cultivated an 18-acre citrus grove. His son Alvin became a local hero for inventing the scarifying plow that pulverized the areas rocky soil and made it easier to plant crops or roll the soil flat for roads. The machine revolutionized farming. Built in 1914 by pioneer Charles McMinn. The house was purchased in 1922 by W.D. Horne and his wife Ida V. Campbell. 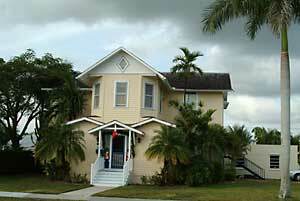 The Hornes moved the house from Krome to its present location on NE 12th Street in 1924. 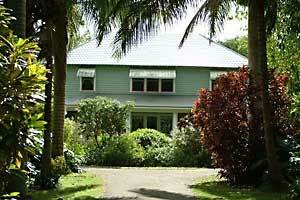 The house is currently owned by Hornes granddaughter. Built in 1930, the Merrits restored the house after Hurricane Andrew and won the 1994 Florida Trust Award for Preservation. 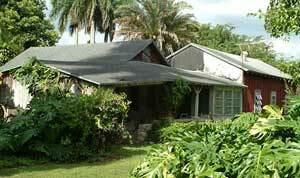 The home is located nearly across the street from the Fruit and Spice Park. This private residence can be viewed from the road, but is not open to the public. Built in 1912 for Henry Wallace Johnston, who planted an avocado grove and experimented with specimens of tropical fruits and flowers. A packing house and canning facility were added and eventually 267 varieties of jam, jellies, marmalades and preserves were made and shipped.